Upgrade your neon or incandescent signs to LED and save up to 90% in energy costs. LED signs reduce energy costs, put out less CO2 emissions and are more energy efficient than any other light source. Not only will these signs cut down on your energy costs, but they will leave less of a carbon footprint. 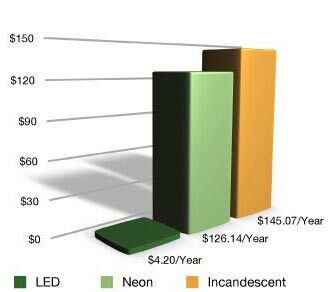 A study compared the energy costs of the different illumination sources for an open/closed sign and a red/green signal. 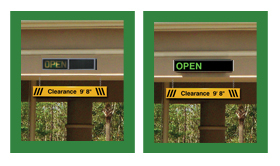 The results showed the annual energy cost savings for a LED open/closed sign could save up to $140 per sign and a LED red/green signal can save over $50 per signal. See our full selection of drive-up signs. Request your free quote for an upgrade today! LED signs from DieboldDirect have a life span of over 100,000 hours. Our LED signs are ran at lower milliamps to keep operating temperatures low. This extends LED life expectancy and consume less energy than standard LED signs. Our LED signs use the brightest LEDs on the market. They are engineered with a special epoxy that protects the LEDs in high temperatures and improves performance and life expectancy.